Best existing copy!! One of only 3 in 9.4 and a sure 9.5 if this grade existed. The thing that sets this smoker apart from the other 2 9.4's is the supple off-white to white pages (neither of the other 2 copies have better than off-white pages). Perfectly cut and centered with off-white to white pages, sharp corners, smooth edges and a killer spine. 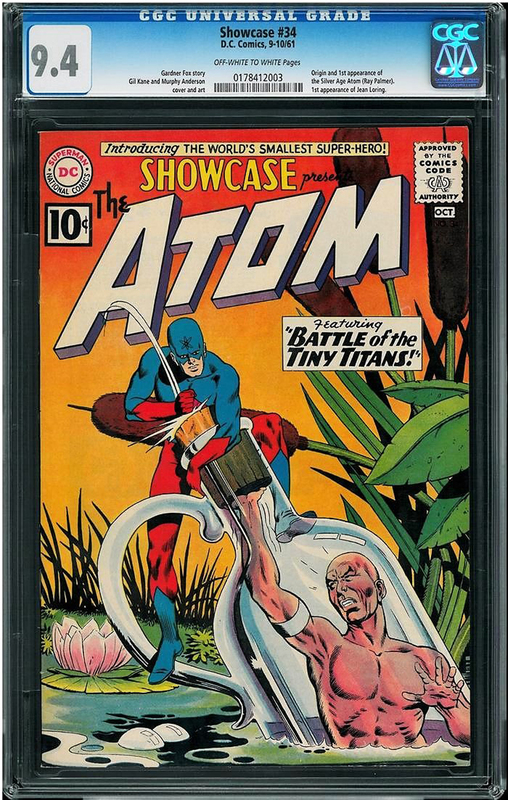 We joke not in deeming this strictly graded Silver Age key the nicest copy in the world! It comes from the private collection of noted collector Calvin Slobodian out of Canada and is newsstand fresh, flat and fabulous. Features the introduction and origin of the Silver Age Atom with a cool Gil Kane and Murphy Anderson cover. You never see this book in grades above 7.5 and here is a true Near-Mint for ya. From September, 1961!